Just a month ago, the hot topic of conversation in the city was about alcohol prohibition. Traditionally, consumption of alcohol has been viewed askance for obvious reasons. Which is surprising because there's more to alcohol than just the buzz surrounding it. Whisky connoisseur Sandeep Arora took a group of us through the nuances of whisky appreciation at the Flying Elephant, Park Hyatt Chennai. The object of the exercise was to explore the romance of whisky, appreciate the complex flavours contained within the bottle, taste and identify its distinguishing notes and finally to discover the kind of food it could be best paired with. That was indeed a challenge for a non-whisky drinker. When barley is steeped in water, it germinates, converting the starches to sugars. The malt is then dried, ground coarsely and mixed with water and left to ferment and subsequently distilled into whisky. 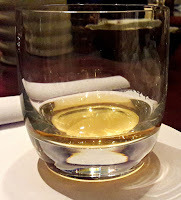 At this point, whisky is colourless. Placed in oak casks to mature for years, it takes on its typical amber hue. Only whisky made from malted barley, distilled at one distillery and only in one batch can be labelled single malt. The masterclass started with a dram of 15 year old Dalwhinnie Highland in our glasses. 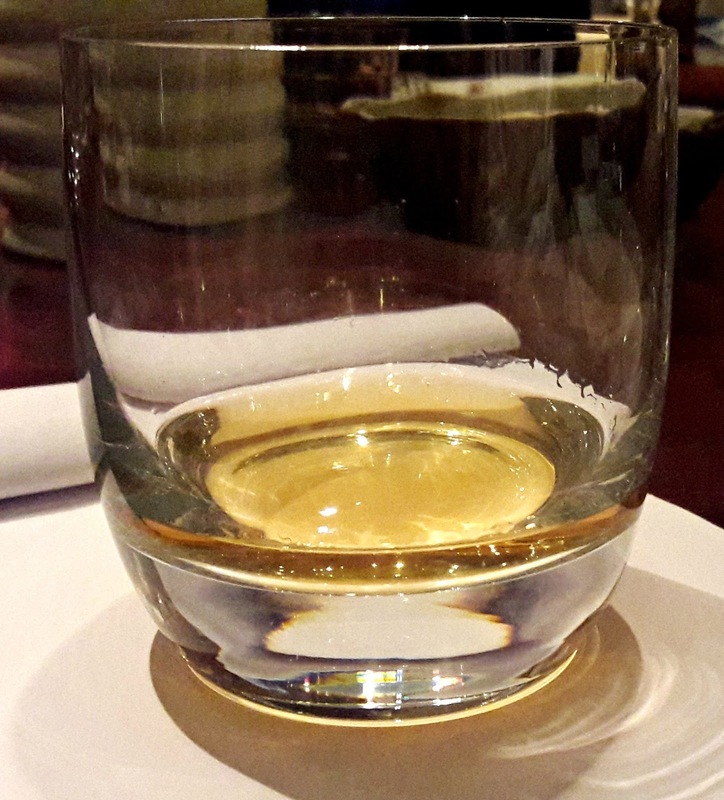 We were taught to look out for the 3 key features of a fine whisky - appearance, the nose and taste. Dalwhinnie, distilled in the highest distillery in Scotland is light gold coloured and rated 95/100. Twirling the glass revealed the legs, an indication of viscosity. Sandeep showed us how to swirl the contents of the glass around and smell the vapours. It smelt of apples and pears, a hint of flowers and honey. Taste revealed more honeyed notes and smokiness. 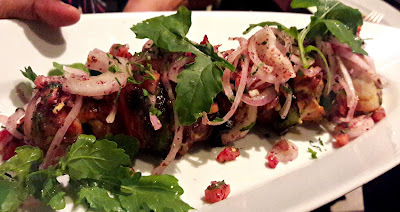 The addition of a cube of ice made the flavours more palatable and at the finish, there was a bit of heat. With it, we were served a basket of Mediterranean breads like pita, lavash and focaccia and a variety of hummus that did not detract from the tasting notes of the malt. The second whisky was a 10 year old Talisker. Made in the Isle of Skye, it was a beautiful gold colour and had seaweed and smoke on the nose. It tasted peaty, peppery, salty and had the unmistakable flavour of iodine. Adding a cube of ice broke up the flavours and it left a tingling finish on the palate. 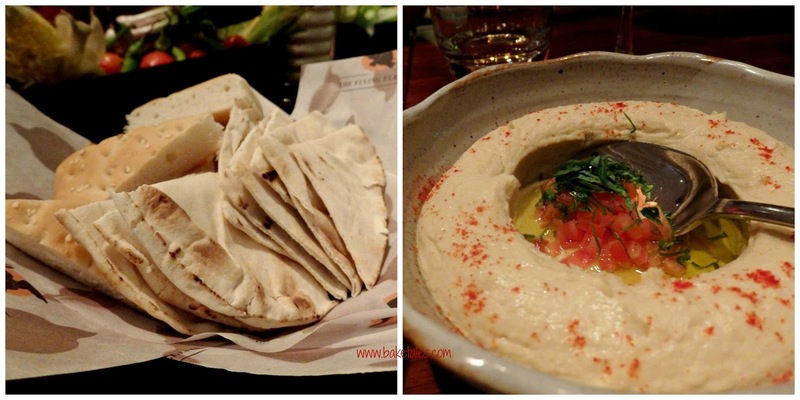 Two foods that worked well with it were corn and mangoes! Grilled scampi and shish tawak were also good partners. The robustness of the malt went well with the umami taste of the former while the peppery notes of the whisky balanced the richness of the latter. 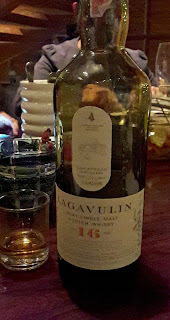 Lagavulin 16 is an Islay single malt, a pungent fellow, full flavoured, intensely peaty, smoky and thick. I found it strident and more peppery than Talisker. Once again, the ice cube mellowed down the flavours and even though it was still intense, there were notes of caramel, dried fruit and vanilla along with pepper that nudged their way out. Obviously this one is a coveted brand and an acquired taste. 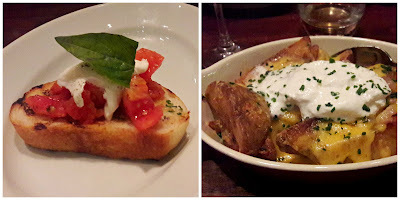 A tomato-topped bruschetta was paired with it though I preferred the pairing of baked potatoes topped with cheese. For me, the cheese gave a better finish to the malt and rounded off the intenseness. 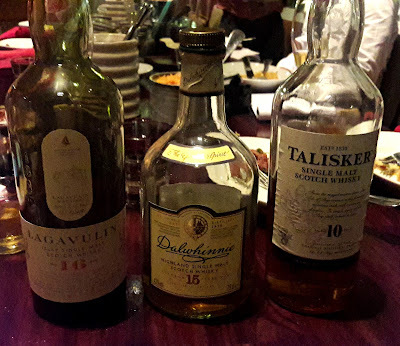 Of the four desserts, the chocolate-based ones had whisky in them. Pairing whisky with food is, after all, all about harmony. And harmonious endings. Disclaimer: all opinions mentioned here are my own and need not agree with those of others.